Nicolas Winding Refn’s follow-up to Drive is a hyper-stylized and incredibly sombre mood piece that is unashamedly influenced by, to the point of possibly being an homage to, the work of Stanley Kubrick, particularly The Shining, 2001 and Eyes Wide Shut, while also evoking Derek Jarman (particularly Edward II), Pier Paolo Pasolini (particularly Salo) and David Lynch (particularly Fire Walk With Me). Unfortunately it is not close to being as memorable, or interesting, as any of those films. The Kubrick influence is the most obvious, in Refn’s use of mise-en-scene, camera movement, spare sound design, blocking, color and score. Refn frames his shots mainly with the subject in the centre of a frame that is symmetrical not only in composition but within its own production design; characters are seen bordered by door frames, columns, walls or other, stationary characters, who are so static as to essentially be breathing props. He occasionally creeps up on disturbing or strange images, very evocative of the camera moves in The Shining; one scene, where “hero” Julian (Ryan Gosling) faces a closed door, terrified, deliberately references the famous “blood from the elevators” of The Shining, especially when complemented, as it is here, with a section of score that is so similar to the music of that film that it may perhaps be considered more rip-off than homage. (Later parts of the film see the score turn away from this motif, but the first third of the film is rife with it). Other than the booming music, the sound design is spare and hyper-stylized; characters stare out at the city of Bangkok with a total absence of traffic noise; nature itself seems devoid of animals, wind or ambiance of any kind. We are in a dream-like world (actually, we are in a nightmare, or, I think, in Hell). Like Kubrick and Pasolini, Refn continually reveals impassive spectators to acts of violence after they are committed. Everything in this film is witnessed, but very little is commented on or judged. Other scenes of non violence are full of witnesses at all times, sometimes stoic police officers, sometimes rooms full of women of the night. The final – or you might say primary, as it is so blatant – Kubrickian reference is the blazing coating of red and blue light that bathe almost every interior scene. Kubrick used red light baths throughout his career but this is exactly the red light of 2001, evoking the terrifying second act of that film. The story, such as it is (and it is the story that is the film’s weakness) sees a young American in Thailand being urged by his mother to avenge the murder of his brother, who was in turn killed for revenge. A weird (and often confusing) cat-and-mouse game is played out on Bangkok streets strangely (but obviously deliberately) devoid of cars, crowds or other realistic elements. This is a story not afraid to be told on a stage, and not afraid to be obtuse. It is useless to offer critiques of the actors as they are directed with as much precise control as the extremely artificial lighting; they behave robotically, talking strangely, usually bound to the spot (including not even moving their heads or blinking), or, when walking, walking in a bizarre, arms-straight-down fashion that you will not see on any actual sidewalk in the world. The Thai actors come across best with this method, as they blend better with the world; Kristen Scott Thomas, as Julian’s demonic mother, comes off by far the worst, with about a third of her lines eliciting derisive laughs from the audience. Whether of not she fulfilled Refn’s vision, her performance is embarrassing and a blot on her exceptional body of work. There is violence, but not as much as Cannes seemed to think; there are certainly striking images, the music is powerful, and a mood is set. It’s a sensuous experience first and foremost, but it becomes very dull far before it reaches its brief running time of ninety minutes. Drive, and many of Refn’s other films such as Bronson and the Pusher trilogy, were thrillingly kinetic; here, by gluing his actors to their spots, their chairs, their exact pinpoints within the frame, he gives us beautiful images but nothing to watch. About halfway through, there is a brief foot chase; it is the best scene in the film, because at least it moves. Though I completely get how most audiences will have your reaction C.J, I have to disagree. 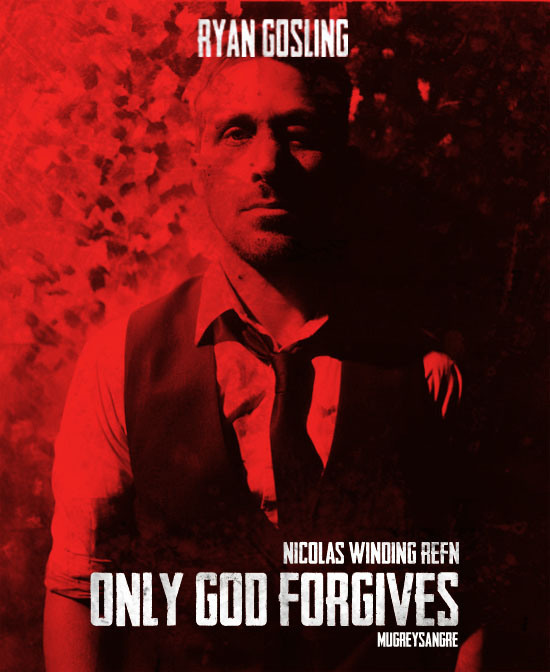 I loved “only god forgives”. I didn’t go into it expecting Drive though, which I feel at least partially is why heaps of people feel let down by the narrative of this one. This is much more paced, structured and and constructed in the vein of “Valhalla Rising”, which is one of my favourite NWR films. I found this film highly experiential, akin to something like “Tree of Life” although, obviously completely different tonally and thematically to that film, this film is a two hour metaphorical acid trip. Whole thing is basically a symbolic dream sequence with flickers of “reality” amongst highly archetypal characters about a man seeking forgiveness for an evil existence from “god”. I can’t really disagree with anything you said though C.J, i did however have the opposite reaction to the film based on the same elements! Stylistically flawless, confident, hypnotically engaging and incredibly innovative in every way, for me.